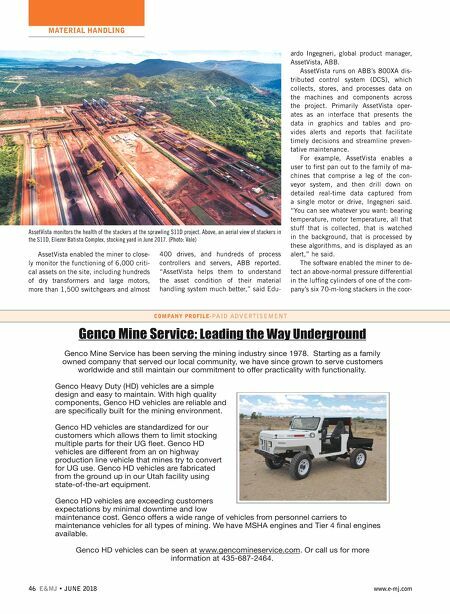 MATERIAL HANDLING JUNE 2018 • E&MJ 47 www.e-mj.com dination yard, where as much as a million mt of ore is stockpiled. The yard operates three bridge-type reclaimers and three twin boom stackers, which were commis- sioned in the second quarter of 2016. AssetVista warned the miner of the abnormal differential, and then launched an investigation that arrived at two pos- sible causes. Either the pressure sensor switched connections or the pressure distribution control system failed. The former would result in inconsistent feed- back for luffing elevation control. The lat- ter would set off a series of events. Either could have resulted in unplanned down- time and possibly cascading costs. The software pegged the situation an alert. On a screen summarizing the per- formance of an entire family, the alert presents as an orange box among other boxes colored to indicate the normal per- formance of the other assets. This allows the user to quickly scan the screen and know which assets merit atten- tion and which are performing as expected. In this case, orange represents a third-level diagnosis. Green, level one, means normal. Yellow, level two, indi- cates attention is needed. Blue is level four, for alarm. Level five is red, for fault; six is black, for bad. Selecting the alert instantly brought up the Health Index Dashboard and Face- plate, which revealed both the limits and the actual inputs for the cylinders. A pis- ton and two rods on two cylinders were registering pressure well above the upper range. Honing in further, AssetVista's As- set Reporter windows revealed, in table format, the severity level, itemized pos- sible causes and recommended actions, primarily a regime of inspections. The AssetVista-generated warnings oc- curred before the standard DCS alarms, ABB reported, which gave the miner time to draw up a plan of action that prevented unplanned downtime. It also typified the benefits and ad- vantages offered by the software. "The maintenance manager can sit on a screen and he sees an overview, and if he is in- terested in a particular asset he can click into it and then he sees all these values the system has processed in the back- ground," Ingegneri said. The system can be customized to highlight the most per- tinent key performance indicators (KPIs). It can also be set according to needs and preferences to send alerts via email. "You would say these are the 10 most im- portant KPIs," Ingegneri said. "Maybe I would like to see more, maybe 20 — that is something that depends on the opera- tional needs of the mining operator." AssetVista delivers push-button re- ports, which can also be customized to contain exactly the information deemed most important by the user. But foremost of the main selling points are the analytics it performs, such as a root cause analysis of an anomalous pressure differential reported by luffing cylinders on a stacker. It also conducts, either automatically or at the push of a button, fault tree analysis, failure mode and effects analysis, and reliability-cen- tered maintenance strategies. 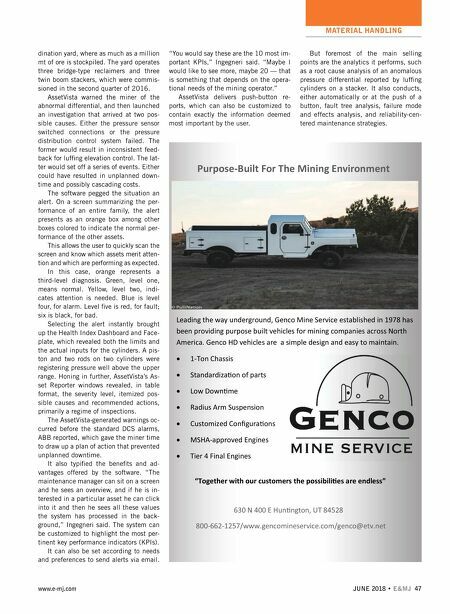 Leading the way underground, Genco Mine Service established in 1978 has been providing purpose built vehicles for mining companies across North America. Genco HD vehicles are a simple design and easy to maintain. 1-Ton Chassis StandardizaƟon of parts Low DownƟme Radius Arm Suspension Customized ConfiguraƟons MSHA-approved Engines Tier 4 Final Engines Purpose-Built For The Mining Environment 630 N 400 E HunƟngton, UT 84528 800-662-1257/www.gencomineservice.com/genco@etv.net "Together with our customers the possibiliƟes are endless"